Gensler has completed the a design for the new offices of law firm Latham & Watkins, located in Washington DC. Washington, DC’s sense of place is characterized by iconic monuments, scenic bridges, and broad, light-filled avenues. 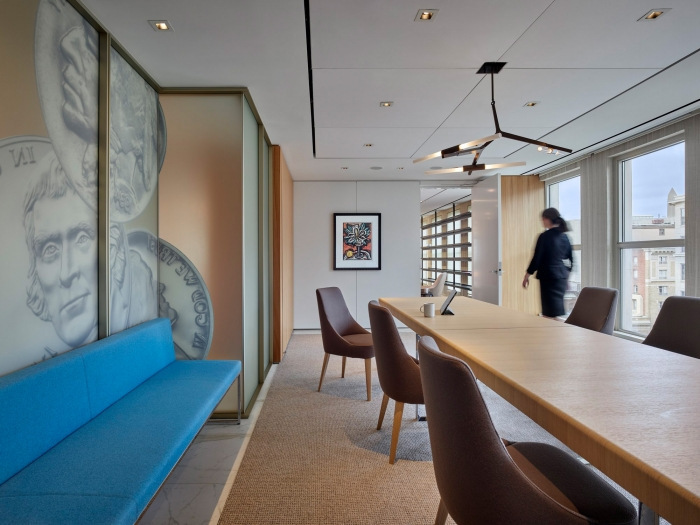 Such urban character proved fitting inspiration for the DC office of a global law firm looking to revamp its workplace for 300-plus attorneys. Thus, the transformation of a dark, dated, and disconnected seven-floor environment into a memorable and connected space suffused with a bright modernity. The centerpiece of the phased, in-place renovation is the addition of an interconnecting three-story stair, which provides the firm with an iconic feature. The stair is augmented by several bridges, which mirror DC’s bridges and horizontal character. Around the central stair, surrounding glass provides a sense of transparency and light as one moves through the space. The stair works as a subtle evocation of steps on the Capitol Building, the Lincoln Memorial, and other DC landmarks. Furthermore, the stair creates a dramatic pathway to an existing terrace overlooking the Old Post Office and the Washington Monument. A wall of frameless glass facing the terrace enhances the interior-exterior connection. Opposite that wall, a mural of an antique DC city plan reinforces the connection to the city. The transformation extends to the workplace, where more glass and light, along with efficient planning that fits new ways of working, help to create a more energizing and collegial experience. And to provide a sense of welcome, the entire space is infused with a hospitality aesthetic. The result is a comprehensive refresh that strengthens the firm’s international brand and bolsters its ties to DC.